PierVantage for Boatyards and Boat Builders | Still using Spreadsheets? Home / Blog / Still Using Spreadsheets? Daily, I speak with project managers, service managers and owners of boat yards and boat builders around North America and beyond who find themselves trying to manage their estimated projects and other key aspects of their business with nothing but a spreadsheet. If you are too, you are not alone. By the time they speak with me, they are frustrated with their current solution and fully understand that they spend more time maintaining their spreadsheets than doing their job, and want to ditch the spreadsheet in the trash for a real estimating/tracking solution. When it comes to calculating data, you’ll be hard pressed to find a more robust, readily available solution than spreadsheets. But when it comes to comparing and reporting on projects, they cause major problems. Lack of Audit Trails: This refers to the fact that an Excel shared document can be edited by anyone, at any time. Unfortunately, if there is a mistake, it is not possible to ascertain when and where the document was edited, and by whom. Cloud storage, such as ERP solutions, clearly shows who last made an edit to the document, and when. Such options also allow for more efficient copying and distribution. How do you easily merge input from multiple people? Limited Reporting: Spreadsheet utilization is impractical when comparing projects and their estimated values versus actual data being posted to the project without significant manual effort. This means that items such as an inventory database and project estimates cannot be compared against other databases. For example, if there is a database that houses a list of customers or vendors, Excel lacks the capability to compare it against an inventory database. Database software, such as ERP, has this capacity. No Version Control: Version control refers to the fact that two people cannot access a Microsoft Excel document at the same time. While this is valuable to prevent mistakes, it can slow down efficiency if several people need to edit the document at once and always results in substantial rework and reduced margins. Cloud storage often offers the capability for different people or groups to access the document simultaneously. Making Quick Decisions: In a spreadsheet-based environment, extracting data from different departments, consolidating them, and summarizing the information so that it could aid the company’s top brass in making sound decisions can be very time-consuming. And because we know how susceptible spreadsheets are to errors, everyone involved in the information processing has to be very careful to keep the integrity of the data intact. Hence, it would be sensible to enforce double-checking as much as possible. Unfit for Agile Business Practices: We’re now in an age when major changes are shaping and reshaping the business landscape: Mergers and acquisitions, management buyouts, new technologies, and so on. If your business isn’t agile enough to adapt to such changes, it could easily be left behind or even face extinction. Spreadsheets are normally created by individuals who lack the slightest know-how regarding software documentation. In the end, spreadsheet files become highly personalized user developed applications. So when it’s time for a new person to take over as part of a large-scale business change, the newcomer may have to start from scratch. 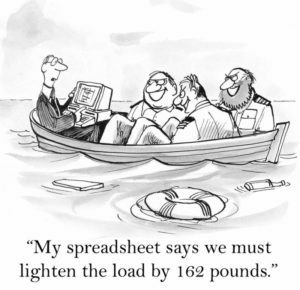 Poor IT Practices: Data in spreadsheets are rarely kept in a single place. In fact, it’s often the exact opposite. The worst thing about it is that they’re always in the hands of non-IT personnel, who are understandably not familiar with storage and backup best practices. If a major disaster strikes, full data recovery can be very difficult if not impossible. As a consequence, even if the company has financial reserves, the absence of data (e.g., estimates, customer records, and inventory) to work on can prevent the company from getting back on their feet quickly.